The kozo paper is treated with persimmon tannin and, after drying, it is crumpled thoroughly, and then smoothed and tailored into wearable apparel. The tannin would color the paper slightly reddish-brown and keep it impregnated against water for a while. Paper clothing was used by poor peasants to keep warm in winter. Matsuo Basho might have used one of these warm robes from Shiroishi. Written on the 7th day of the 2nd lunar month, 元禄2年2月7日 at a lodging with とう山 Tozan, a haikai friend of Boku-in 木因 from Ogaki, Sora and others. One hokku of the collection 七吟歌仙, written at the lodging. kamiko　was a robe to keep Basho warm on the trip, but then he realized it was already warm and heat shimmers were around, so he could take it off and enjoy some warmth.
. Dresses made of paper, kamiko 紙子 - 紙衣 . Preparing his trip "Oku no Hosomichi"
Basho was not carrying much luggage and had to make do with his old paper robe. All he could do is fold it again to show the proper pleads. This is a rare glimpse of the man Basho, worrying about his proper outfit for a haikai meeting.
. Matsuo Basho 松尾芭蕉 - Ok no Kobumi . 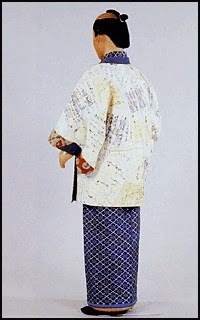 In Osaka Kabuki, the main actor wears a robe made of paper, kamiko 紙衣. This does not flow naturally around the body and the actor has to make extra efforts to show a natural pose. This wryly humorous winter hokku was written in the 10th month (November) of 1813, the year Issa returned for good to his hometown. In Issa's time there were two basic types of paper clothing for commoners: utilitarian winter outer robes and coats (mainly for people who couldn't afford expensive thick cloth robes) and fashionable decorated paper coats or cloaks (haori) worn not only for warmth but for display. Paper might seem to be a weak and fragile material, but these paper coats and robes were made from thick, fiber-dense washi paper and coated numerous times with a varnish made of persimmon tannin to make them windproof and waterproof, so they were quite popular in Issa's age. In this hokku Issa displays his love of personification by writing directly about paper cloaks, not the people wearing them, as if the cloaks were alive and were the most important thing about the wearer. I think he does this to indicate that the wearers are infatuated with the elegant coats they wear and are interested above all in showing them to other people -- at the moment the wearers may almost feel as if they were their clothes. This is interesting, because the coats walk down a "female" slope, that is, the longer, gentler slope path from a Shinto shrine or Buddhist temple (or both, since they were often built side by side) at the top of a hill or low mountain. The "male" slope is the shorter route, usually consisting of a long flight of stone steps going straight up the side of the hill. These paired terms are not directly related to the gender of the pilgrims visiting the shrine or temple, so the people in paper coats could be either male or female. Issa says that the paper coats are well-matched, and by this he seems to mean at least four things: 1) the paper coats make their wearers look more attractive, 2) the wearers seem to have chosen the coats because they think it's important to look attractive, 3) the various coats go well together in a group, and 4) the coats are well matched with the path down the gentler slope. I think the fourth meaning may be Issa's main focus in this hokku. Dedicated pilgrims in traditional white pilgrims' robes or in ordinary commoner clothing probably tend to use the shorter and more direct route both going to and coming from the shrine or temple, or at least to use the shorter route when returning downhill, but the wearers of the paper coats use the gentler, easier path even when going downhill. This easygoing attitude seems to indicate they are mainly interested in showing themselves to others and in sightseeing -- especially in viewing the clothes of other visitors to the temple -- rather than in worshiping, praying, or meditating. The personification of the paper coats may be an accurate, shasei-based evocation of the religious atmosphere surrounding many of the visitors to the shrine or temple. in a master's paper coat! Issa's admiring students in his hometown area seem to have told him a stylish paper coat would perfectly match his status as a famous haikai poet, but this kind of praise seems ineffective. This is a picture of a commoner in a stylish paper cloak with calligraphy on it and with cloth around the edges.
. onna-zaka, onnazaka 女坂 women's slope. in my paper robe . . .
. Katsuragi 葛城 deity Hitokotonushi . Thank you Gabi san for your study on Kamiko. It is very precious research and explanation. they really look nice ! I don't really experience Kamiko robe. I would like to wear it in my whole life. Is this a humorous caricature of someone else or a self-portrait of the poet? I prefer to think the latter. 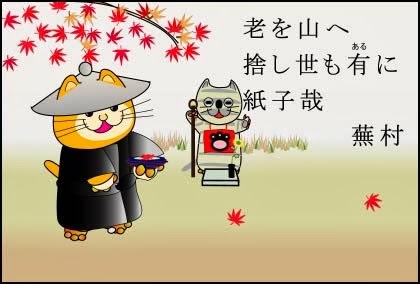 Paper robe (kamiko) is a winter season word: a thin, wind-resistant outer kimono.